You asked. We listened. Start saving time and money with our Full Service Payroll today! Calculate your Full Service Payroll costs! Ready to start your FREE 30-day trial? 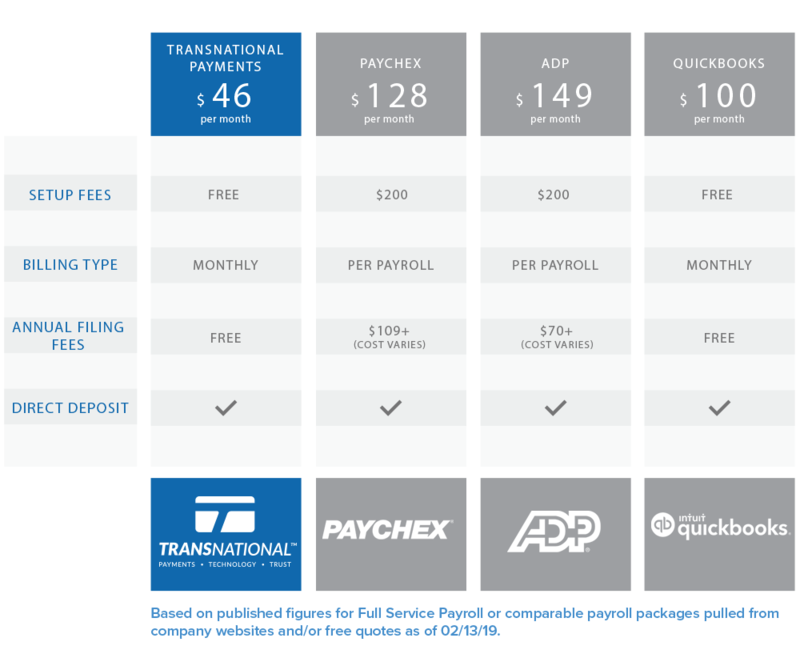 Run payroll online anywhere, anytime, with any frequency — weekly, monthly, whatever works for you. Experience software that’s as flexible as your business needs. Pay your employees through direct deposit, paychecks (printed or handwritten) or cash with our small business payroll. Don’t have time to switch payroll providers? No worries, we’ll set up your entire account for free! Questions? Contact us for US-based support via phone, email or chat. We’ll file and deposit all federal, state and local taxes (includes W-2s and W-3s). You get guaranteed accuracy and security with our corporate payroll solutions. Just pay month-to-month, access payroll anywhere you have wi-fi and rest assured knowing your business’ financial data is securely stored in the cloud. Your employees have secure access to their pay stubs, pay history and payroll information with our payroll solutions. Do you run multiple payrolls in a month? Your savings could double! With Full Service Payroll, you'll be as excited about payday as your employees. Questions about small business payroll? Let us know how to contact you with answers. *Good news: This base price includes 1 employee!